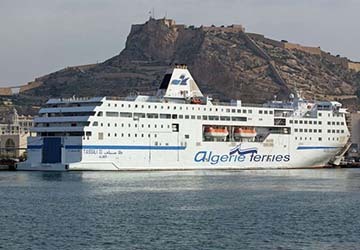 Built in 2004 and now an integral part of the Algerie Ferries fleet, the Tassili II provides a combination of services that are sure to make your sailing a smooth one. This spacious ship has room for up to 1320 passengers and 300 vehicles on each crossing. The vessel is equipped with 2, 3 and four bed cabin accommodation options with a further 600 armchairs located throughout the public deck areas. All rooms contain a TV, toilet and shower facilities ensuring both comfort and luxury whilst making your trip. Algerie Ferries have gained a great reputation for their culinary prowess on board the Tassili II. Whilst making your journey you’ll be able to choose from gastronomy delights at the al la carte and self service restaurants, ideal for breakfast, lunch and dinner. Please Note: Whilst we have taken great care in making our Tassili II guide as accurate as possible, onboard facilities, services and entertainment may vary depending on the date and time of year that you travel, facilities mentioned may change without notification and ferry companies reserve the right to operate vessels other than those mentioned at time of booking without prior notification.